I am so proud of myself! I went camping with no electricity or running water! And I wasn’t scared or uncomfortable one bit! It's not the kind of primitive camping that Confessions of a Catholic Mutt does (so I'm sure she's getting a good laugh out of this! ), but for me, it's a milestone! I guess I really should preface that with it was only for 1 night, and it wasn't like it was out in the wilderness. There were no bears, and we didn't even see any raccoons. The only sign of wildlife were the bullfrogs that serenaded us all night long. And I mean...ALL.NIGHT.LONG. We went to this place because: 1) once again, we waited too long to try to get a reservation at a campground, and 2) there were some offroad people riding the trails where we were. (That's the talking/music you hear in the video.) They stayed across the pond from us; the "campground" was just a field that had been roped off, so we couldn't stay there with our trailer. We thought it was going to get really dark after the sun went down, but the moon must have been fairly bright. CH put the solar panels out and we were able to charge our phones and my tablet. AND, we did have service, so I was able to chat with some friends on FB. So...not exactly roughing it, and I did have my "luggable loo" to save the day. As I said, we were right next to a pond, which supplied an opportunity for some "reflection" pictures. Monday, we just hung around the house and made a trip to Lowe's. I loved that they were playing patriotic music pretty loudly. While I'm on this...does anyone else think it's inappropriate to say, "Happy Memorial Day"? It's kind of like saying, "Happy 9/11", isn't it? It's a tragedy that so many young men and women sacrificed their lives so we can have our freedom; it just seems odd to hear/see "Happy Memorial Day". 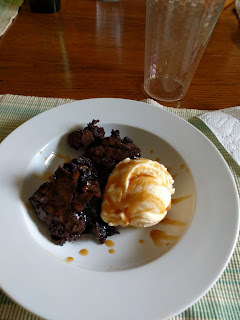 We invited Daddy up for burgers last night; YS had the idea to have brownies and ice cream, topped off with caramel sauce spiked with Jack Daniels. He was spot on! It was fantastic! Yum with those brownies! Love the reflection pictures. Good for you for going camping like that! Much braver than I would have been. I want some of that dessert please!! Great photos and kudos for 'roughing' it for a night. That's one night more than I would do!! I think your camping experience is astounding. no choice. I wish I wasn't so high maintenance, but I am, so will enjoy reading about your camping escapades. Good job, Missy! You took some beautiful photos. Thanks for sharing with us! The frogs DO sound like ducks!!! Glad you had a good time while being (semi) primitive! I thought about you this past weekend....I had my first trip to Key West. No, we didn't camp, but we did pass a lot of campgrounds. LOL!! That is a big step! The frogs would have driven me nuts. Did you bring ear plugs? I don't like when people say "happy Memorial day" either. I heard from many veterans that say it is a no no. I don't even think many people actually know what Memorial Day is. I see too many people partying it up; it's a 3 day party weekend. Your very brave. I've been telling Mark about your small camper. I need to show him some of your posts. I would like something like that. Of course I want water and electricity!! Reflection pics are BEAUTIFUL! I like YS's idea of dessert! I cannot wait until we can "hook up" at a campground!